The Tanoa Tusitala Hotel in Apia, Samoa was a hub of excitement this week. 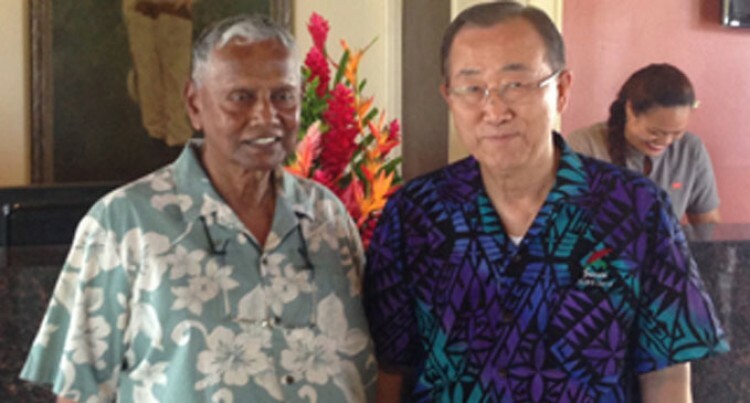 Not only did the Fijian-owned hotel host parts of the United Nations Conference on Small Island Developing States but the UN’s very own General Secretary, Ban Ki-moon stayed there. Mr Ban opened the four-day conference, themed: ‘The sustainable development of small island developing States through genuine and durable partnerships’. Chairman of the Tanoa Group Yanktesh Paermal (YP) Reddy expressed how proud the 4.5 star international hotel was to have hosted a man of Mr Ban’s stature. Mr Ban was generous enough with his time to have photographs taken with the Tanoa Team and Mr YP Reddy. Mr Reddy said: “The Samoan government and people of the independent state of Samoa can rightfully be incredibly proud of the way it has showcased its beautiful people and culture to the international community. The Tanoa Tusitala Hotel is part of the Tanoa Hotel Group. The group is owned by the Reddy Group established as a small construction company in Suva, Fiji in 1947. Tanoa Tusitala is set in 6 hectares of lush tropical gardens, just metres from Apia’s waterfront and a few minute’s walk from the central business district. The hotel reflects key elements of Samoan architecture and culture. It’s central courtyard is dominated by hand-tied fales (traditional Samoan houses), housing the lobby, restaurant and bar.